Jason Somerville and Daniel Negreanu are two of the outspoken critics of the DOJ opinion and its sponsor, Sheldon Adelson. A group of PokerStars pro called out casino mogul Sheldon Adelson over his deleterious stance on online poker in America. The U.S. Department of Justice recently changed its opinion on whether online poker sites and online casinos are legal. Several Team PokerStars members, including Daniel Negreanu, Jason Somerville, and Chris Moneymaker, voiced their disdain for the DOJ opinion and the person they believe to be at the center of that decision: Las Vegas Sands Corp. founder and CEO Sheldon Adelson. Banning online gambling in the United States has been an ambition of Sheldon Adelson since 2014, when he said he would spend whatever it takes to see a comprehensive ban on US online gambling. In the wake of the decision by the DOJ to do just that, US media organizations pointed out that Sheldon Adelson’s lobbyists had directed letters to key members of the Trump administration advocating such a ban. Some officials were in the Department of Justice. Eventually, journalists discovered that some of the language used by the DOJ’s Office of Legal Counsel in their opinion banning interestate online was the same as the language used by Adelson’s lobbyists. Chris Moneymaker tweeted a link to a Washington Post article which singled out Sheldon Adelson for his lobbying effort against online poker. Sheldon Adelson claims online gambling is a particularly bad habit for problem gamblers, so the LVS executive argues that he is protecting problem gamblers from the ravages of addiction. Adelson also once cited his grandchildren’s computer skills in suggesting underage gamblers could circumvent age verification programs and thus were at risk from licensed online gambling. The Team PokerStars members do not buy the story. Instead, they believe Sheldon Adelson has used his wealth to buy influence at the Department of Justice in order to squelch potential competitors. As the person who has made more than any human being in history from gambling — and his share of problem gamblers — Moneymaker, Somerville, and Negreanu do not believe Adelson’s protests that he is concerned about problem gamblers. Poker Hall of Famer and MasterClass instructor Daniel Negreanu was a bit less diplomatic than Moneymaker or Somerville in their remarks, simply calling Sheldon Adelson a scatalogical term (thread provided). For their part, the Poker Players Alliance (PPA) called for feedback from members and poker fans about the new DOJ policy. PPA lobbyist Rich Muny said bankers and financiers would be the Achilles heel of the US online gambling industry under the new policies. 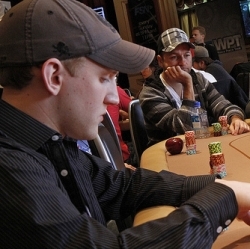 Will DOJ Enforce Anti-Online Poker Policy? It has yet to be seen how the Department of Justice will enforce its new policy. Several times during the Trump administration, policies were spelled out that a department simply did not enforce. The decision ultimately will be up to the 46 individual US Attorneys spread across the United States. A DOJ opinion is designed to instruct prosecutors how to act. Ambitious US attorneys looking to stand out or particularly offended by a certain violation of DOJ policy might take action against local operators. There is every indication that state attorney generals will fight back against any DOJ actions, citing states’ rights and equal sovereignty protections. In short, everything could play out in a US federal court of law. Or the DOJ officials, with a ton of other cases on their docket, might not do anything with the decision. We’ll know when Rod Rosenstein’s 90-day grace period ends in April 2019.